Skadi is available for adoption from Fetching Dogs. 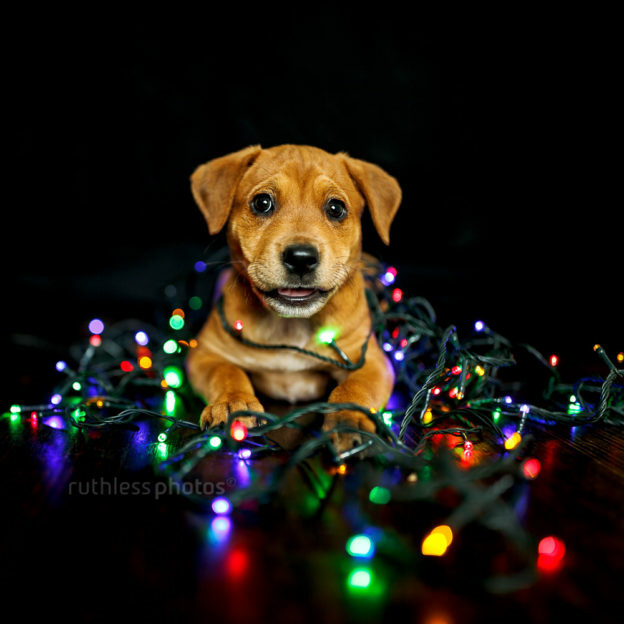 This image and four other Christmas puppy photos have been made into greeting cards and will be on sale in the Ruthless Photos online store soon, with all profits going to the charity. Orders placed after the cut-off won’t be completed until March 2018. *In Australia, that is. International customers will need to contact us. What if I miss the cut-off? You can still order from the discounted section, just allow at least a week for shipping. Gift vouchers will also be available right up until Christmas Eve. They’re sent electronically to print at home. We’re donating a voucher for a bespoke collar and lead to Fetching Dogs for an upcoming raffle that I’ve organised. There are so many amazing prizes, I want to enter myself! I’ll send details in November when tickets go on sale. You can also subscribe to the Ruthless Photos mailing list to be first to know. This entry was posted in informational on October 20, 2017 by Ruthless74@.